Since baccarat is not an overly popular game amongst many casino players, many online casinos have yet to release a proper version for Macintosh computers. As a result, we have searched far and wide to find the best baccarat games for Mac, and we are proud to recommend the online casinos below to our fellow Apple enthusiasts. Feel free to click the Visit button to go to the casino and sign up for a free account so you can check out their graphics and games selection. As there are many intricate elements to a baccarat table and various ways to wager, having a clean, clear, user-friendly betting interface is absolutely imperative to both the integrity of the game, and player experience. Below you will find a list of the best Mac compatible casinos who offer baccarat at a level that compliments the power and technology of Apple computers. The following is a list of the various baccarat games that you can find in the online casinos listed above, and a few facts about each. We also provide some rules and strategy to help you understand the game better. There is a reason that this is 007 James Bond’s favorite game – it definitely requires a lot of thinking. Punto Banco is the type of baccarat played in most of the casinos in the Western World, and is simply referred to as “baccarat”. In this standard version the house deals out two hands and is obliged to pay on either depending on the strict rules and outcome of the game. The two hands dealt are to the player (punto) and banker (banco), with neither entity having ownership over the hands. 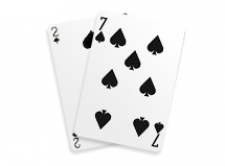 The cards are dealt one at a time and as soon as either hand reaches a total of 8 or 9, the round is over and bets are paid accordingly. Please note that it is possible for the hands to be tied, and players can wager on this outcome as well. EZ Baccarat is very similar to traditional baccarat except there are a few small rules adjustments that give a better edge to the house, and make it easier for live dealers to calculate commissions. The main way that this achieved is by paying a winning banker bet even money at 1:1 instead of the traditional 19:20 except when the banker wins with a push hand. Ultimately with this rule the casino is taking a 4.91% commission on every winning banker bet that a player has wagered. Chemin de Fer, or “iron road” since cards were originally put in an iron box, was the first version of baccarat ever played. This game started in France many years ago and is still the most popular version played there today. However, Chemin de Fer is quite different from the normal version, and the rules are very complicated. Six decks are used and players have designated turns on which to make wagers and challenge the banker. This version should only be played by baccarat veterans who are reasonably comfortable with every facet of the game.